ESPN announced today that Magic Johnson is leaving NBA Countdown and the network. Johnson, per ESPN, is leaving "due to his other commitments," which haven't been a problem in the past. Richard Deitsch reported earlier today that Doris Burke is joining the NBA Countdown crew on some Wednesdays this season. (And it sounds like she hadn't heard the news about Magic. She told Deitsch she was looking forward to "asking Magic, Jalen and Avery smart questions to facilitate good discussions.") ESPN says it's still in the process of figuring out its Countdown and commentator lineup. 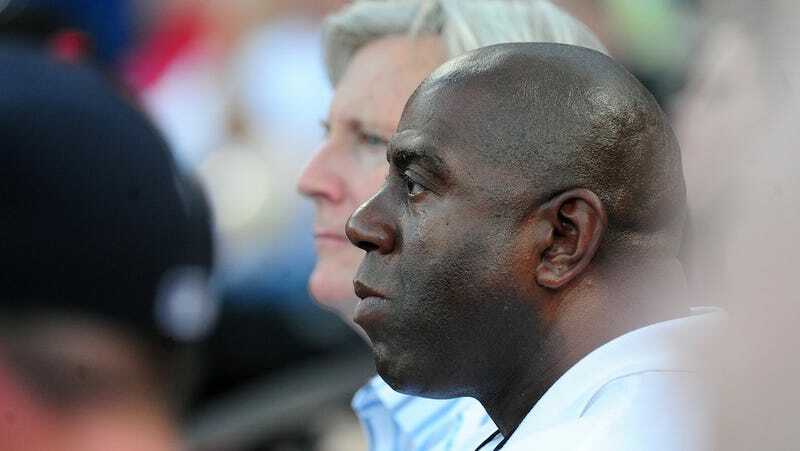 Earvin "Magic" Johnson informed us today that he'll no longer be part of our NBA coverage due to his other commitments. We appreciate Magic's contributions and wish him well in his future endeavors. We are in the process of determining our NBA commentator roles for the upcoming season. I love ESPN. Unfortunately, due to the nature of my schedule and other commitments, I don't feel confident that I can continue to devote the time needed to thrive in my role. I will always feel a strong connection to the ESPN family and I enjoyed working with them very much. I'd like to thank John Skipper, John Wildhack, Mark Gross, Kim Belton, Amina Hussein, Mark Summer, Adam Hertzog, Bob Rauscher, Stuart Scott, Mike Wilbon, Jon Barry, Jalen Rose, Bill Simmons, Chris Broussard and the many others at ESPN for the wonderful opportunity to talk about the game I love. They are the best in the business.